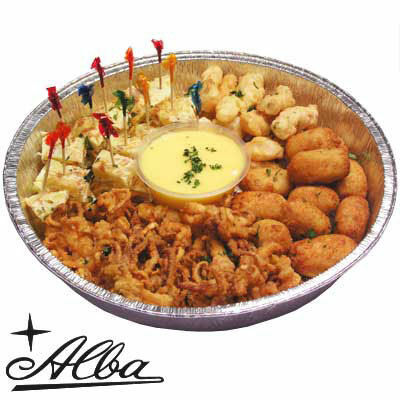 Everyone will surely enjoy this selection of Spanish appetizers: calamares y rabas (squid rings), pescaditos (small fish fillet), croquetas de pollo (chicken croquettes), and tortilla Española (Spanish potato omelet) served with aioli (garlic mayonnaise). Satisfy your craving for authentic and soulful Spanish cooking! Make it Spanish! Make it Alba! 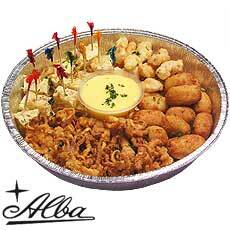 Comes in a ready-to-serve aluminum round tray and convenient to-go box. Serves 8-10 Persons. Please allow at least TWO WORKING DAY prior to the desired date of delivery.